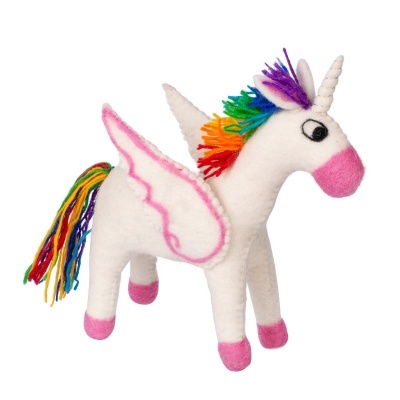 Imagine someone talented making this gorgeous handmade felted rainbow unicorn, in a faraway mountainous place full of magic. Made in Nepal, this gorgeous creature is hand-stitched from 100% felted wool, carefully decorated with a colourful woollen tail and a horn wound with silver-coloured thread. Pretty wings and bright, beady eyes complete the picture, designed to fire your child's imagination and make life more fun.